The company reported a third quarter GAAP loss from continuing operations of $22.8 billion or $2.63 per diluted share. Substantially all of the loss was due to a $22.2 billion ($2.56 per diluted share) goodwill impairment charge related to the Power business. In the prior year quarter, GE reported GAAP net earnings of $1.3 billion or $0.16 per share. Excluding the goodwill write-off and other Non-GAAP adjustments (i.e. non-operating pension benefit costs, restructuring charges and charges against businesses currently held-for-sale), GE’s adjusted earnings were $1.18 billion, down from $1.83 billion last year and its adjusted EPS was $0.14, down from $0.21. GE’s share price, which had enjoyed a modest rebound immediately following the announcement of Mr. Culp’s hiring, began its latest slide on Oct. 21. Since then, the stock has fallen 23.7%, from $12.17 to its Nov. 2 closing price of $9.29, which represents a 9-year low. It seems obvious that the stock has reacted to the torrent of disappointing news in the earnings report and conference call: the cut in the quarterly dividend from $0.12 to $0.01, the large goodwill write-down, worse than anticipated performance at Power, the withdrawal of earnings and cash flow guidance for 2018, a recent debt downgrade by Standard & Poor’s, hints of additional losses in its legacy insurance book and an expansion of the SEC’s investigation into GE’s accounting practices (to include this quarter’s goodwill charge) – even though several of these were disclosed in the Oct. 1 press release announcing Mr. Culp’s hiring. On the conference call, Mr. Culp said that after 30 days on the job he sees GE as a “fundamentally strong company with a talented team and great technology.” He reaffirmed the results of the strategic review that was completed under former CEO John Flannery’s watch, which calls for the separation of GE’s Transportation, Oil & Gas and Healthcare businesses. In fact, he noted that the actions announced on Oct. 30 – the cutting of the dividend and the separation of the Power segment into two businesses – were consistent with the thrust of the strategic review. During his first 100 days, Mr. Culp intends to position GE’s businesses to win in the marketplace and also to accelerate the deleveraging of the company. Still, the recent sharp drop in GE’s share price reflects disappointment with the apparent lack of progress that the company has made over the past 18 months in improving its financial performance and outlook. Over this period, investors have been subjected to a steady stream of negative announcements which have shaken their confidence in one of the most visible symbols of America’s industrial prowess. For some, this latest spate of selling undoubtedly represents capitulation – a belief (or fear) that it is now more likely than not that GE will not be able to continue even in its slimmed down form; that it will be broken up completely, perhaps in a bankruptcy proceeding. Although such fears cannot be dismissed out of hand, they do seem premature at least and they ignore the strengths of the consolidated GE (which have been confirmed recently by Mr. Culp). To get a better handle on the company’s current situation, I will offer my impressions on each of these new developments and then summarize these thoughts to offer some thoughts on the company’s valuation and near-term prospects. The Latest Decline in Power’s Performance. Even with the low expectations of investors preceding the earnings announcement, Power’s 18Q3 results were disappointing and management did not provide any clear assessment of the business’s future prospects. This quarter, we learned that the company has taken a $200 million charge to address an oxidation issue in the HA and 9FB-class turbine blades. It also booked a $400 million charge to address certain project “issues” related to its own execution as well as certain partner and customer-related challenges. Those project issues have contributed to the “negative variable cost productivity” that Power has reported now for the second consecutive quarter. As a guess, it is possible that Power is struggling with some of the trade-offs between structural cost cuts and operating efficiency. The reorganization of the Power business into two segments: a unified Gas products and services business and an “all other” segment consisting of Power’s steam, grid solutions, nuclear and power conversions businesses, is intended to reduce costs further by eliminating Power’s headquarters structure and give Mr. Culp direct insight into the gas business’s performance and prospects. Investors generally agree that the decline in Power’s performance is a major problem, but it should be noted that the segment has still generated $20.5 billion in revenues, $19.5 billion in orders and has operated at a breakeven level year-to-date. Although that performance significantly lags the prior year levels (with revenues and orders each down by about 25%) and Power will likely record an operating loss for all of 2018 and perhaps even for 2019, the business still has significant market share and a large installed base, which should allow it to find an acceptable level of profitability eventually, even if market conditions remain challenging for the next few years. I don’t want to minimize the problem, but, GE has a lot to work with here and the global demand for gas-fired generation is likely to be sufficient in the coming years to facilitate a performance turnaround (as long as GE’s newer large scale turbines do not suffer repeated performance problems). GE wrote off $21.1 billion, excluding the digital assets, of Power’s goodwill in the 2018 third quarter. The write-off is non-cash, but it does reflect a reduced long-term assessment of the business’s future profit and cash flow generation prospects. After the write-off, Power still had about $2 billion in goodwill on its books. Power’s assets at the end of 2017 totaled $71.1 billion. GE does not disclose Power’s (non-debt) liabilities, which would facilitate a rough estimate of the business’s post-write-off equity book value. But if its liabilities are proportional to its assets (as a percent of total industrial assets), I estimate Power’s current equity book value to be around $15 billion after the goodwill charge. At the very least, GE almost certainly still assesses Power’s current value to be significant (i.e. well into the billions of dollars). Strengthening the Balance Sheet. Besides maintaining its capacity to service all of its outstanding debt on a current basis, GE also needs a strong balance sheet to maintain its good standing among the various counterparties with which it executes derivatives transactions and creditors of both GE and GE Capital. In early October, Standard & Poor’s downgraded GE’s and GE Capital’s short-term credit ratings from A-1 to A-2 and their long-term credit ratings by two notches to BBB+. Moody’s and Fitch, which currently have GE on credit watch, currently have short-term credit ratings of P1 and F1, respectively, and long-term ratings of A2 and A on the two businesses. The S&P downgrade, which will probably be followed in the near future by Moody’s and Fitch, has raised GE’s and GE Capital’s borrowing costs, especially in the commercial paper market. Anticipation of downgrades has also raised the company’s collateral requirements on derivatives. To address these problem, the company has been working aggressively to reduce its exposures. Average combined borrowings of commercial paper totaled $12.8 billion in the 2018 third quarter, down from $19.8 billion in the comparable prior year period. The company plans to minimize its use of the commercial paper market going forward. GE has also disclosed that cash collateral posted on derivatives declined from $2.1 billion at the end of 18Q2 (the first quarter that it began making this disclosure) to $1.8 billion at the end of 18Q3. The added cash retained from the cut in the dividend combined with cash generated from the sales and spin-offs of Transportation, Oil & Gas and Healthcare should help GE achieve a meaningful reduction in its leverage over the next few years. GE is targeting a solid “A” credit rating over the long-term. A Reassessment of Insurance’s Capital Needs. On the conference call, CFO Jamie Miller noted that GE would be performing its annual assessment of the capital needs of its run-off insurance-related assets. This may have come as a surprise – it did to me, anyway – following the $6.2 billion after-tax charge that the company took at the beginning of the year to put the business on a sounder financial footing (and in good stead with its regulators). GE’s10-Q indicates that incurred claims, net of reserve adjustments, surged 33% in the 2018 third quarter versus the prior year. In the first half of 2018, those net claims had increased 6.4%; but the third quarter surge brought the year-to-date increase to 15.3%. The company says that a 5% increase in claim costs, holding all other assumptions constant, would result in a $1.5 billion increase in reserve requirements. This would be offset at least partially by the recent increase in interest rates. According to the company, a 25 basis point rise in interest rates would reduce claim reserve requirements by $1.0 billion. Thus, if the 15.3% year-to-date increase in net claims holds for the full year, GE’s reserve requirements should rise by roughly $4.5 billion, but this would be offset partially by the impact of the 75-basis point increase in interest rates, which would reduce reserve requirements by $3.0 billion. On a net basis, GE’s reserve requirements would therefore rise by about $1.5 billion, if these assumptions hold. On the conference call, management said that it currently anticipates injecting $3 billion of equity into GE Capital in 2019. Withdrawal of 2018 Earnings and Cash Flow Guidance. With the worse-than-anticipated performance of Power, GE said that it would not meet its previous guidance for earnings and cash flow for 2018; but it declined to provide a revised estimate. This has obviously stoked concerns that its performance may deteriorate further in the 2018 fourth quarter and continue to be weak in 2019. 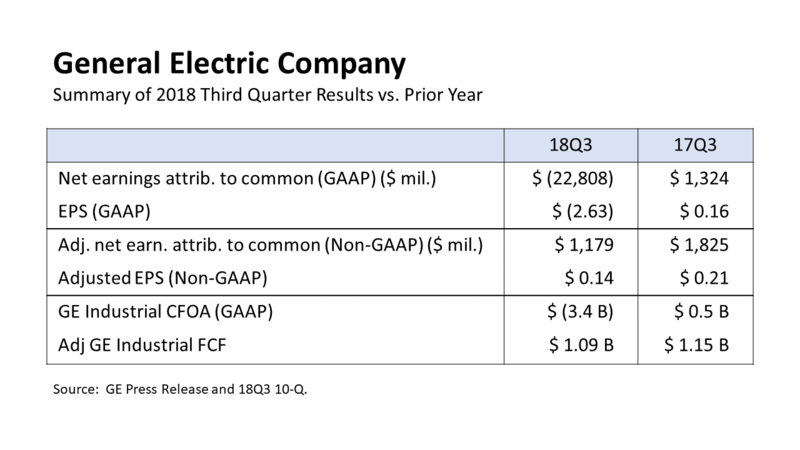 Based upon my quick assessment of the company’s performance and recent trends, I anticipate that GE will report a 2018 fourth quarter GAAP loss of $0.02, bringing its total GAAP loss (from continuing operations) to $2.52 for all of 2018. Excluding certain items, consistent with the company’s format, my projections anticipate adjusted net earnings per share of $0.11 for the fourth quarter, which would result in full year adjusted EPS of $0.60. Management’s previous guidance anticipated 2018 adjusted EPS of $1.00-$1.07. On a similar basis, my projections suggest that GE could produce $2.0 billion of industrial free cash flow in the 2018 fourth quarter, bringing the total for 2018 to $2.3 billion. That would be well below management’s previous guidance of $6.0 billion of free cash flow. SEC Investigation. As noted in its quarterly filings, GE has disclosed that it received notice from the staff of the Boston office of the SEC in November 2017 that the SEC had opened an investigation into GE’s revenue recognition practices and internal controls related to its long-term service agreements (i.e. its accounting for contract assets). That investigation was subsequently expanded in early 2018 to include the $6.2 billion charge related to its run-off insurance operations and now to the $22 billion goodwill impairment charge in the Power business. GE could conceivably agree to settle the matter, if the SEC uncovers evidence of wrongdoing; but the company has provided detailed descriptions of the circumstances leading up to each of these accounting charges/changes and I do not recall any instances in which GE has admitted that any of its accounting practices have not complied with GAAP. Accordingly, it seems unlikely that the SEC’s investigation will result in any sanctions that will have a material impact on the company. Summary and Conclusion. Taken together, the new disclosures in GE’s third quarter earnings report added to the already heavy concerns that investors have about the company’s future, but it is not surprising to hear more bad news after the recent appointment of Mr. Culp as CEO. Although the problems at GE are real and management must continue to press forward to address them as quickly as possible to avoid a further deterioration in performance, there is nothing (so far at least) that I have learned from GE’s third quarter results that suggest that the company has suffered a more significant and permanent impairment of its potential value. Admittedly, though, the steady stream of multi-billion charges that the company has announced in almost every quarter over the past year has taken a heavy toll on investor sentiment. Putting an end to those negative announcements, if indeed it is possible to do so, is a prerequisite to GE’s share price finding a bottom. My assessment of no additional impairment of GE’s value is supported in part by Mr. Culp’s assertion that he sees no need for GE to raise additional equity capital at this time. Although it is somewhat surprising that Mr. Culp would make such an assertion since he is still new to the job, he presumably made this statement on the basis of his review of GE’s capital position with members of his executive team; so except for possible sudden changes in the global economic environment, there probably are not any new bombshells yet to be disclosed that would cause Mr. Culp to reverse his stance. It is still possible, however, that he could change his mind as he learns more about the company or if the company’s performance continues to deteriorate. That adds import to Mr. Culp’s upcoming address to investors in early 2019. Despite this risks, the assumptions that I made in my simplified valuation model for GE have not changed sufficiently over the past two months to change my assessment of GE’s current valuation. That valuation did not specifically address the value of GE’s Power business, but instead pointed out that GE was trading at an enterprise value-to-EBITDA multiple below 10.0, after the planned separations of the Transportation, Oil & Gas and Healthcare businesses, and that a substantial portion of that remaining EBITDA was attributable to the Aviation business, which should be valued at an EV-to-EBITDA multiple that is substantially higher than 10.0. Although my 2018 EBITDA assessment for Power has declined, its impact has been more than offset by the decline in GE’s share price. Consequently, my analysis suggests that GE’s implied EV-to-EBITDA multiple for the remaining businesses is now below 9.0 times; so there is now even greater upside potential in the shares. One Response to "After Earnings, GE’s Stock Hits a 9-Year Low"